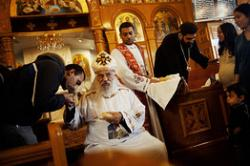 Egypt’s Coptic Christian Pope Shenouda III has died at the age of 88, state television has announced. The leader of the Middle East’s largest Christian minority was reported to suffer from cancer that had spread to several organs. Coptic Christians make up 10% of Egypt’s population of 80 million. 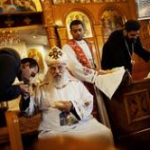 After attacks on Coptic Christians in recent years, Pope Shenouda urged officials to do more to address the community’s concerns. His political adviser Hany Aziz told Reuters news agency that Shenouda “died from complications in health and from old age”. The BBC’s Jon Leyne in Cairo says Pope Shenouda sought to protect his Christian community amid a Muslim population by striking a conservative tone and lending tacit support to President Mubarak’s rule. Many younger Copts will now be looking for a leader who can help redefine their community’s role in a rapidly changing post-Mubarak Egypt, our correspondent adds.